If you are born disabled in Ghana, West Africa you are likely to be poisoned, or left to die by your family; and if you are not poisoned or left for dead, you're likely to be hidden away in a room; and if you're not hidden, you are destined to spend your lifetime begging on the streets. Of the twenty million people in Ghana, two million are disabled. This is the story of one disabled man whose mission-and purpose- is to change all that forever. 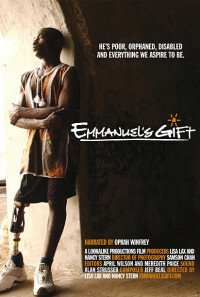 In Emmanuel's Gift, filmmakers Lisa Lax and Nancy Stern have uncovered a story as compelling as it is important. Narrated by Oprah Winfrey, the film chronicles the life of Emmanuel Ofosu Yeboah, a young Ghanaian man born with a severely deformed right leg, who today, against incalculable odds, is opening minds, hearts and doors-and effecting social and political change throughout his country. While Emmanuel's message is vital: people with disabilities are valuable contributors to any society, his method is inspirational. Emmanuel begins his quest with a bicycle ride, over 600 kilometers, across Ghana with one leg-and continues to spread his vision with grit and resolve. Lisa Lax and Nancy Stern have been documenting Emmanuel's plight for over a year, having shot over 100 hours of powerful imagery. The film includes original footage shot in Ghana, California, Oregon and New York, as well as photographs and other acquired film/video of Emmanuel's early years. Through it all, they have created an intimate insight into the mind and heart of a visionary whose unforgettable journey transcends continents and cultures and becomes each of ours to share. Regions are unavailable for this movie. 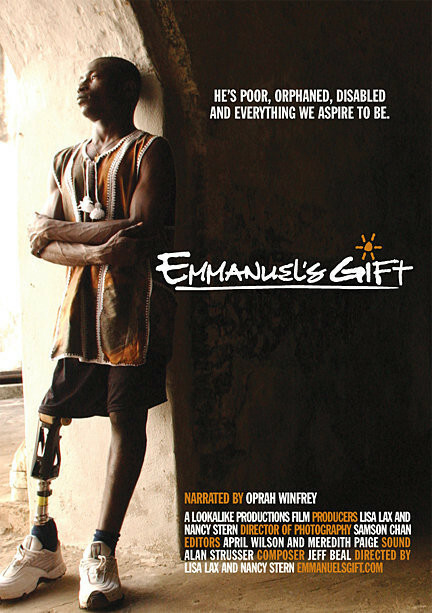 Click the "Watch on Netflix" button to find out if Emmanuel's Gift is playing in your country.